The Great Samsung Sale is also happening in your favorite Aerophone Stores! Catch them until September 17. The Great Samsung Sale is also happening to your favorite Aerophone Stores. This sale has been making rounds online due to the best deals Samsung is giving away with every smartphone/tablet purchase. 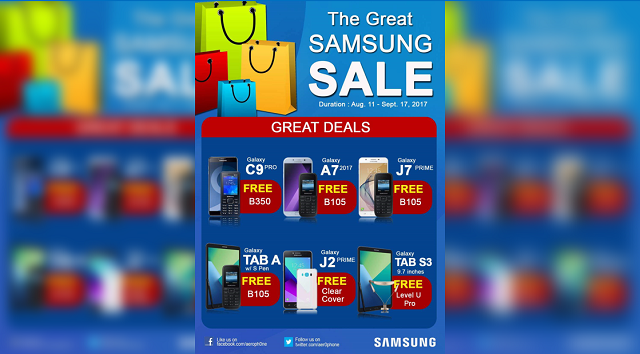 The Great Samsung Sale is happening in Aerophone Stores from August 11 until September 17. Aerophone is highlighting one of its best deals with the Samsung Galaxy C9 Pro. When you buy the said handset, you'll have a FREE B350 feature phone. Likewise, the Samsung Galaxy A7 2017 is bundled with a new B105 feature phone. These are just two of the great deals you'll find in the Great Samsung Sale. Visit your nearest Aerophone stores nationwide to enjoy the Great Samsung Sale. Contact them in their Facebook Page.